Peanut butter is loved the world over for its creamy goodness, especially on toast or baked goods. But many consumers probably don’t realise that, like many mass-produced food items, store-bought peanut butter contains chemical preservatives and many questionable ingredients, such as hydrogenated oils, trans-fats like margarine, and lots of sugar. Furthermore, commercial nut butters use nuts that are roasted unevenly or already burnt. Like coffee, burnt nuts produce a rancid and bitter taste, and manufacturers try to mask the foulness by adding lots of sugar or unhealthy fats. This results in an end product far removed from its original form. For those who prefer less processed foods or are watching their sugar intake, the high level of processing can be off-putting. 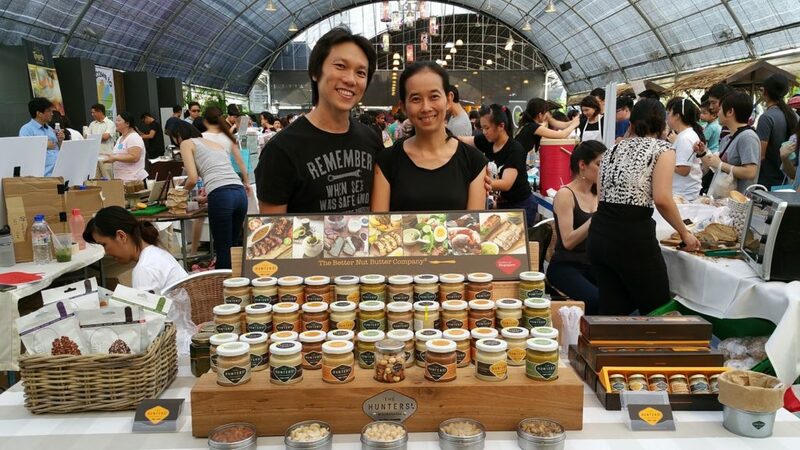 It was a desire for a different kind of nut butter – one that not only tasted good, but was also low in sugar and used only natural ingredients – that prompted Herbert Salim and his wife Natalia Sugiarto to start The Hunters’ Kitchenette. “I couldn’t find a good product back in 2013. So we started making it on our own at home,” says Salim, 44. Salim dedicates his free time – he has a full-time job as a senior architect in local practice WOHA – to making small-batch nut butters under The Hunters’ Kitchenette brand. The name draws inspiration from the hunter and gatherer diet, which harks back to ancient times when early humans were, well, hunters and gatherers. Surviving off the land requires consuming only what is local and natural; for modern humans, it means cutting out as much processed foods and refined carbohydrates as possible. These foods were created in the industrial age, when countries were developing new ways to feed the masses. Salim, his wife and his two school-going children were on a quest to lead a much healthier lifestyle and incorporated the Hunter Gatherer diet into their daily lives. Packed with nutrients such as vitamin B, calcium, dietary fibre, omega-3 fatty acids, protein and vitamin E, nuts are a staple in a clean diet. The Hunters’ Kitchenette’s products are made at its factory in Tuas food factory. It currently has eight types of nut butters, made with cashew, almond, pistachio and macadamia, and also distributes roasted nuts under its Nut Nut brand. While each 200-gram jar is relatively pricey at SG$15 for cashew butter to SG$19 for its best-selling almond and pistachio blend, only the best ingredients are used. That means raw nuts, roasted at a suitable temperature with a special far infra-red oven, unrefined coconut palm sugar and sea salt. Salim doesn’t use peanuts in his product range because he finds other types of nuts to be more nutritious. “Most of our nuts have much more micronutrients like magnesium, phosphorous and calcium compared with peanuts,” he says. What is phytic acid and why does it matter? Nuts and seeds contain a naturally occurring substance named phytic acid that stems mineral absorption. Unfortunately this can hinder their nutritional value but phytic acid levels can be reduced by roasting the nuts before consumption. But to lower the phytic acid level and retain the natural taste you need to roast the nuts the right way, Salim says. “The traditional way of reducing phytic acid is called sprouting, or soaking, where you soak the nuts and leave them to dry. This process is time-consuming and not efficient, so we had to find a different method,” says Salim. The Hunters’ Kitchenette’s nuts are treated with far infra-red rays, or FIR, using a specially sourced oven with a rotating drum. Salim likens the process to cooking with a claypot, using gentle simmering heat that will bring out the sweetness of the nut. Over-roasting burns the outside of the nut while the inside remains uncooked, producing a burnt taste and destroying the nut’s healthy fats. FIR cooks the nut evenly, reducing the cooking time. The FIR-treated nut is also paler on the inside than a conventionally roasted nut, which gives Salim’s nut butters a creamier colour compared to store-bought options. As the benefits of pure nut butters become better known in Singapore, supermarkets have started important nut butters from organic food makers. Salim, however, doesn’t see the foreign products as competition. The Hunters’ Kitchenette’s black sesame and cashew sesame spreads are catered to Singaporean tastebuds, which are familiar with black sesame products in the form of ice-cream and in glutinous rice balls, a popular Chinese dessert. “Taste and texture wise, we are completely different from imports,” he says. What’s next for The Hunters’ Kitchenette? Educating consumers about healthier nut butters was a major challenge. The makers of artisanal chocolate have it much easier, says Salim, as chocolate is easily recognisable and is always in demand. “Most of our customers didn’t know anything about nut butter,” he says. “They don’t know that our product has no added oil and is good for your health. “Another misconception is about the sugar in our product. Many people, especially diabetics, are turned off when they find out that our product contains sugar. Salim thoroughly enjoys testing different types of nuts and blending them to make new and interesting flavours. 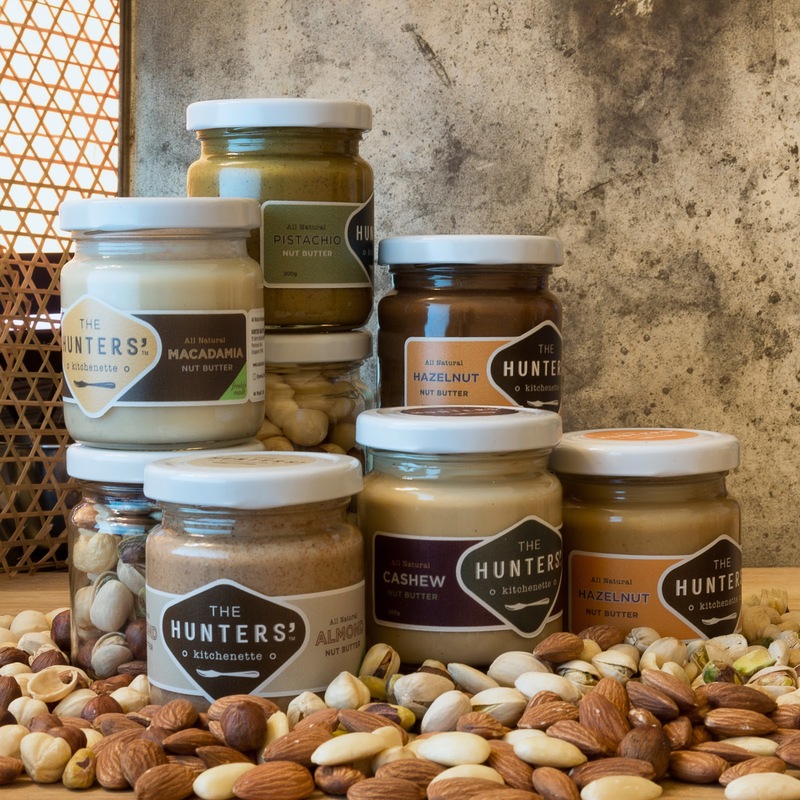 The Hunters’ Kitchenette’s almond and pistachio spread is its most exclusive product, as well as a crowd favourite. Salim noted that pistachio is somewhat exotic and has a strong flavour. Pistachios are also harder to source, he says. “Our customers’ first choice is usually the macadamia butter, as they are used to the idea of macadamia ice-cream. But in reality, macadamia has very little flavour, so it doesn’t translate well into butter,” he says. At the moment, Salim has no concrete plans to expand The Hunters’ Kitchenette. He is quite happy making a small volume of nut butters for his loyal customers, balancing his passion project with his job as an architect.